I am reposting this interview with The Great Bill Gillespie which I posted back in July 2013. I have since had the pleasure of painting his image as “Be-Real-Son” as Watercolor Clown #15 in my series and will post a follow up post to this blog post with the progression of his painting. 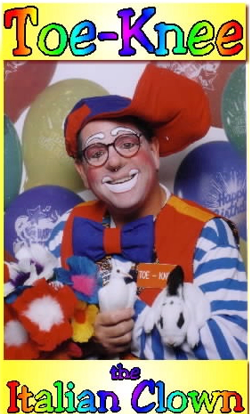 Today I have the pleasure of introducing you to a great clown from the Jacksonville Florida area. He has many different faces of which he has provided photos for us to see. So let’s get to know Mr. Bill Gillespie – A.K.A. “Toe-Knee” the Italian Clown, “Dr. OH-NO”, “The Honorable Be-Real-Son”, “Box Car Billy” and “Flowers” the clown. 1. How long have you been a clown? 2. Who inspired you to become a clown? I was inspired by a clown by the name of “Rainbow the Clown”. I was in the navy at the time, Cecil Field Fl., and Rainbow entertained at our Squadron Christmas party. When I found out how much she was paid … and the rest is history. 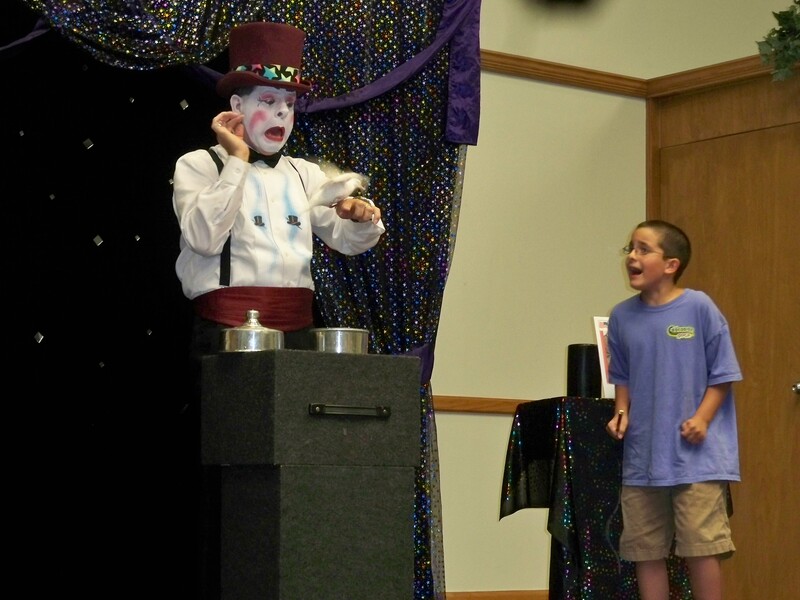 Really, I was looking for a vocation because in 1994 I would be retiring from the Navy, and since I could do magic and balloons already and there was a bigger call for clowns than there was for magicians, here I am today! 3. Where did you receive training? I first received training from books, on how to put makeup on and do balloons, in 1991 I went to Gator Clown School here in Jacksonville, FL. I also went to Advanced Studies put on by “Buttons” McBride , and Advanced Studies on the Road. I also attended conventions that taught me a lot and other clown schools. The main school that launched my money making was “Comedy College” in Norfolk VA – it was more about marketing and it taught me an enormous amount. 4. What people do you give credit to in helping you advance your art in clowning? I was helped by “Bubba” the Clown of Orange Park FL, “Freckles” of Jacksonville, Mr. “G” (Jim Green) of Orange Park, FL, “Mama” clown of Ft. Lauderdale, “Blumbo” of Orlando FL, and “Buttons” as you already mentioned – these were my mentors. There were many others that helped at the South East Clown Convention also that helped shape my characters, and to anyone I have forgot, forgive me, I Love You and keep on Bumping a Nose! 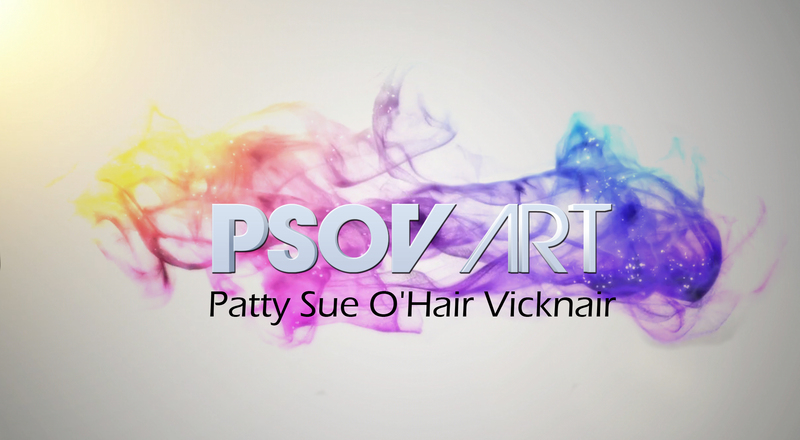 I owe the most to my wife Cindy, without our spouses we wouldn’t even be able to thrive in our art! Perhaps not as a Mentor but as my biggest supporter! 5. Are you involved with any clown organizations? 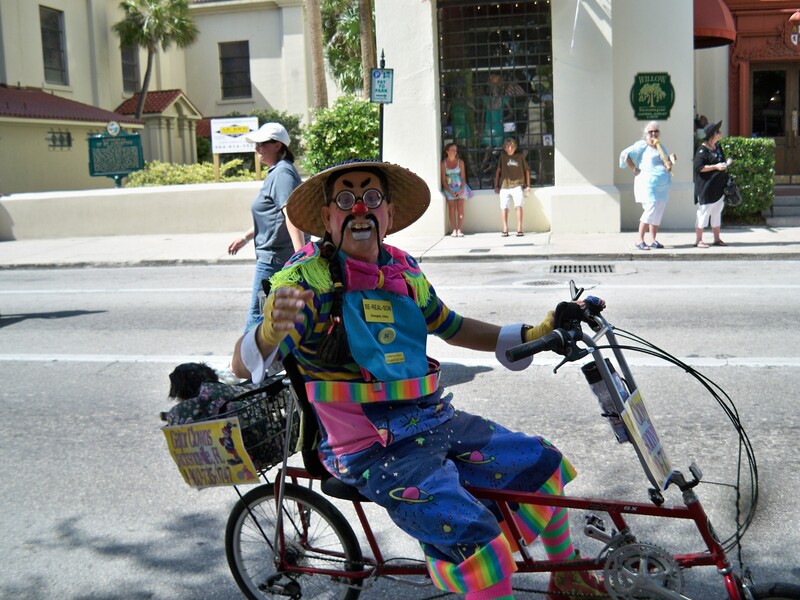 I am mainly involved with the Gator Clowns of Jacksonville,(http://gatorclowns.com/) I am the President. Also, I am involved with Wolfson Childrens hospital, we have a clown group there, I have been going there for 17 years. 6. How do you feel your clown has evolved over time? How did you settle on the particular style and design of your clown or the personality you try to project as a clown? I have developed my many characters over time, through a “feeling.” My birthday party clown “Toe-Knee” was developed as a big 9 year old kid, kid friendly and silly. My Chinese character “Be-Real-Son” because I have always since a child loved oriental things… the art, the people, the food, everything. Be-Real-Son being without a doubt the funniest, drove me to continue to develop it to the point of everyone loving the character. 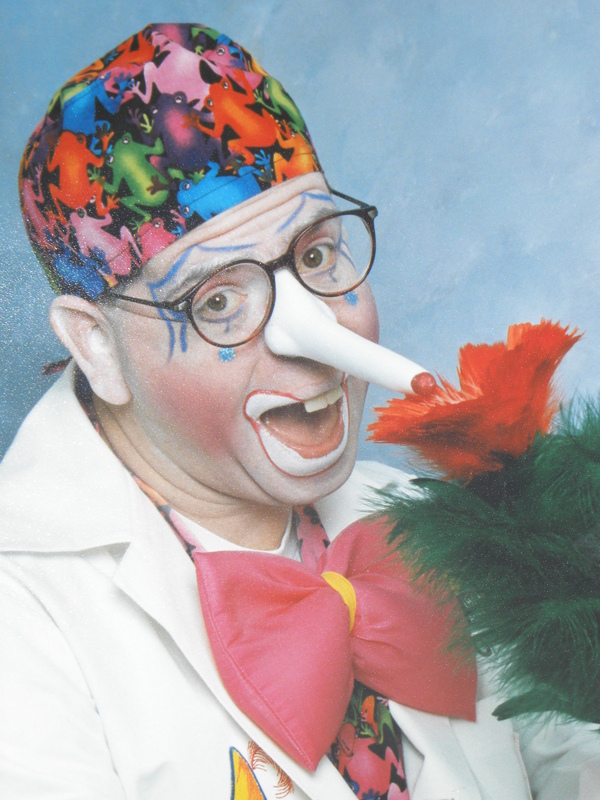 My other characters I have, Dr. Oh-No was developed when I first started with Wolfson Childrens Hospital, as a hospital clown, looking somewhat like a doctor, with a lab coat and “SCRUBS” hair cover. I settled on Toe-Knee as a birthday party clown because he is definitely loved by the kids, children don’t really think Be-Real-Son is as funny as do adults. I settled on Be-Real-Son for clown competition and adults because he wins because he is so funny, and unique. Also, with Be-Real-Son, once I am in face I become a different person, my inner Chinese takes over. 7. I have learned a little more about clowns and I know there are different types of clowns, What kind of clown are you and what do you feel is your clowns most interesting characteristic? 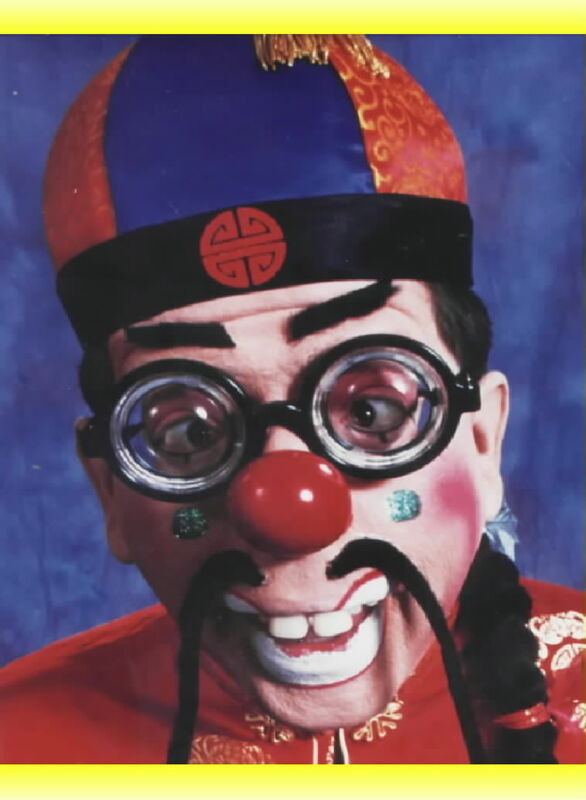 2nd – Character Clown – My Chinese character “Be-Real-Son.” Most interesting is everything about him, his looks- Funny, his actions – Funny, just a funny funny goofy looking clown. 8. Have you ever worked in a Circus and if so which ones? Worked in a Circus – NO, worked at a circus Yes. I was vacationing in Budapest. They have the largest in door circus in Europe there. I was with a friend who was also a clown and we got permission to entertain with balloons, (pre-show) . It was an experience to entertain somewhere where we didn’t speak the language and they didn’t speak ours. We met the main character of the circus, a clown from Italy who lived there during the season and then went home to Italy in the off season. It was fun. Mainly birthday parties for children, that is the bread and butter in my area. I do also get hired for conventions and other events. The highest paying event was an event I did for CXS railroad. They wanted 15 clowns to do face painting and balloons. The event was in Waycross GA, they were christening a new locomotive and there was a Congressman and other dignitaries there. Alot of people were there. All 15 clowns were there for 5 hours – they paid 12 thousand dollars for us to be there – a nice pay day! 10. Do you have bits that are standard in the clown world or do you create your own acts? My acts with Toe-Knee are a mix of different magic performed in a way that is unique to me. Now, Be-Real-Son – everything he does is unique because he is unique. I get ideas when I am in character that I don’t get when I’m not. 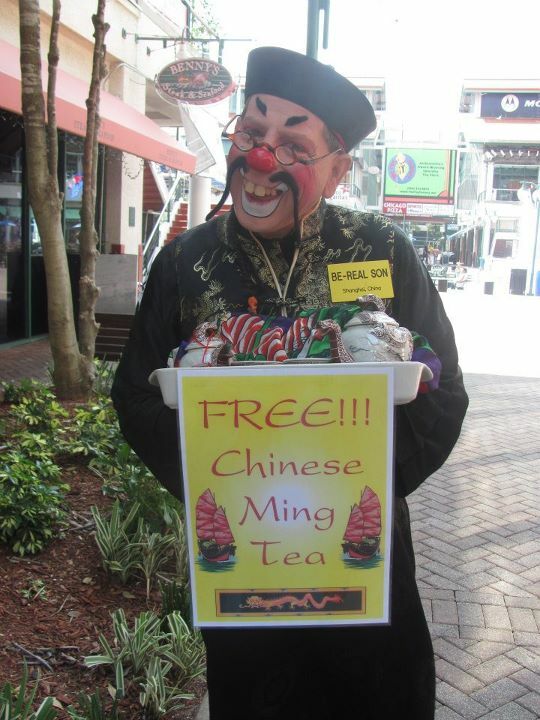 It is very weird, I become a complete different person as a Chinese Clown. 11A. If so did you make them yourself? I don’t make them, I may change them to fit my character tho. 12. If you are in a parade do you ride anything? Bike, Unicycle, Clown car? I ride a bike. I sent you a photo of me on one of my bikes. I also bring my daschund dog with me, the people love her. Once they see my dog, they take photos of her, not me. Again, Be-Real-Son does parades, everyone loves the silly Chinese Clown. 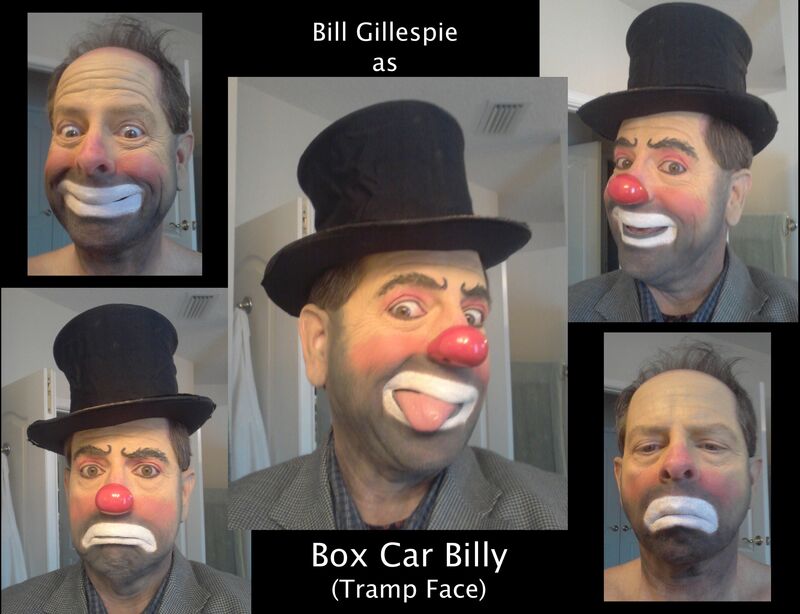 If you happen to be in the Jacksonville area and you need a great clown – call Bill Gillespie! I hope you have enjoyed this post about another wonderful clown. Please follow his links and read more about him on his web page. Thanks to Bill for all his help in creating this blog.